Do you believe in half-price wine offers? Any more than you believe in half-price sofas, carpets or kitchens? Any more than you believe in Santa Claus or the tooth fairy? The fact of the matter is – and you can quote me on this – that the whole premise of ‘half-price’ wines is a fiction, a con and a bit of a scandal. Once in a blue moon there’s a genuine offer out there where a retailer has acquired a parcel of heavily discounted wines for some reason – bankruptcy, liquidation, cancelled orders – that can be offered with a substantial, maybe even 50%, reduction. But those are rare exceptions. These are dangerous days with ‘deal of the day’ web sites distorting the market (and our understanding of quality and value) through endless ‘better than half price’ offers. The supermarkets are playing the BOGOF and half price game more furiously than ever before, but the wines they are selling are not, never were and never will be, genuine. They are commodities dreamed up by the buyers and suppliers specifically for such promotions. Rarely are they worth more than their supposed ‘special offer’ price. These Jaume Serra cavas are cases in point. The notion that anyone would pay £12.99 for them is laughable. And yet, I have to say they are very good little wines at their ‘better than half price’ offer of £4.99; more than competently made and amongst the best sparkling wines you could buy at this price. So although I am against the deceit and falsehood of half price wines, I commend these two cavas. At £4.99 each they are, well, my deal of the day. A blend of the three traditional Cava grapes, Xarel.o, Macabeo and Parellada with 20% Chardonnay, this pours with a healthy stream of small bubbles and a fresh lemon and apple nose touched by herbs and a note of butteryness. On the palate it is fruity, fresh and appealing, with nice orthodox apple and pear flavours and a well-balanced finish. 86/100 and Definitely a bargain at the offer price of just £4.99 until 25th August 2012 in Tesco. 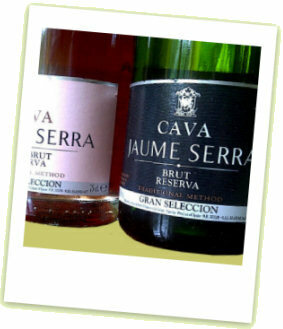 The rosé partner to Jaume Serra’s Brut is also down to just £4.99 until 25th August 2012 in Tesco. It’s a blend of 80% of the local Trepat with 20% Pinot Noir and spent 15 months in bottle before release. It pours a pleasing soft pink and has fine bubbles, with the aromas fairly subdued, but showing a hint of redcurrant and herbs. On the palate a pleasant strawberry fruit quality is really nicely balanced by the acidity here, the soft mousse and dry, raspberry and redcurrant acidity fine into the finish. 86/100.